Only a few weeks after we last wrote about the problems experienced by struggling businesses on Churchfield Road, and less than a week after Sonny Masson presented a petition to a Council meeting last week, the hated CCTV van was back again yesterday morning. Sonny Masson called us in despair. 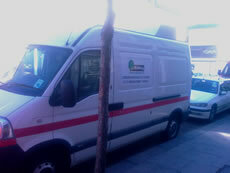 After several phonecalls to councillors and parking services, the van moved on at around 11am. "I couldn't believe it when I saw it again this morning, parking on two 'stop and shop' bays with the engine running pumping out fumes. "We presented a petition to Ealing Council only last week about this - signed by hundreds of residents, business owners and shoppers." - The chance to use stop and shop bays in front of the shops (currently they are often being used by the mini-cab firm who, it is alleged, have an arrangement with local wardens). - Clear signs on the loading bay. - No more CCTV vans and fixed cameras harassing their customers. Sonny told the full meeting of councillors: "All of our businesses on Churchfield Road are losing money. Just last week two businesses decided to pack up and leave. Two more are looking for premises outside the borough. "Shops that have been empty are not being taken by new business due to over-enforced parking restrictions. We are returning to a rundown part of the borough we all worked so hard to regenerate over the last twenty years. This is all down to a problem we have been complaining of for six years." Sonny says that the combination of traffic wardens, enforcement vans and a fixed camera is too much for one 'b' road. With the credit crunch and many customers being scared away by parking enforcement and tickets, the drop in business for these shops is dramatic. He pleaded with Ealing Council to stop what he says is "disproportionate" parking enforcement from three separate sources "before they finish us off." C Virdee from Acton Central Heat told us that his business is 50% down on the same period last year. Customers have been given tickets when parked on a loading bay in Milton Road in order to collect supplies from the plumbing shop. "People come here to buy radiators, baths, big boxes which take time to collect and load up. They are getting tickets and it's making it impossible to run our business. They have been told by wardens that they need to keep their engines running and a door open in order not to get a ticket. But that seems unrealistic. We admit that people can get let off their tickets if they write in with evidence - but this all takes time so next time they will simply go elsewhere to buy what they need." He added: "This seems to us just like one big money-making exercise." Sonny says that, "we have never had a problem with traffic flow around here. I would have loved Ealing Council to have answered the points in my petition. They seem to be listening and nodding their heads, but in the mean time we are faced with this disproportionate behaviour which is chasing away our customers and will ultimately mean that Churchfield Road businesses go elsewhere to trade. "It seems as though Cllr Seema Kumar is trying her best to help us but the system won't allow her to speed things up. "I wonder if the Council is aware that all of us here refund regular customers for their parking tickets because we know we just can't afford to lose them at the moment. These are, I admit, difficult times for all the businesses. But if it was just the credit crunch we were battling I wouldn't be so worried. If I lose a further two customers a day because of parking restrictions, that may just be the last straw for me." Cllr Vlod Barchuk told us: " In the next few months, Acton Central ward forum money will be used to change the stop and shop bays between Birkbeck Rd and Alfred Rd from 60 to 30 minutes (other stop and shop bays in the area will remain at 60 minutes) to discourage mini cabs from parking in the bays directly outside Churchfield Rd shops. In the medium term the loading bays may be replaced with stop and shop bays. "The Council is also looking at the feasibility of installing a free ticket Display machine that would require all users of the bays to display a valid permit. Users would have to enter 3 digits of their vehicle registration number when taking a permit from the machine. The machine would not a issue a permit for the same vehicle registration number until the no-return time had expired. This method has been used elsewhere (eg. Kirchen Road, West Ealing) where there was the same type of problem with mincabs." A local shopper said: "Let's hope this all happens quickly enough to help these struggling businesses which we really don't want to lose".